« The London Underground: Should I walk it? 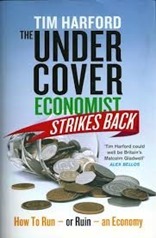 Tim Harford’s latest book "The Undercover Economist Strikes Back". It’s about macroeconomics, a sort of blaggers guide. Tim Harford is a writer and broadcaster. I’ve also read his books The Undercover Economist, about microeconomics and Adapt, about trial and error in business, government and aid. When I get the time I listen to his radio programme More or Less, about statistics and numbers, and also read his newspaper column. Hey, what’s going on here? You keep writing down the questions I’m asking! Yes, this is how Strikes Back is written. At the beginning I found it a bit irritating but as you can see I’ve taken to it. It recalls the method Socratic dialogue and Galileo’s book, Dialogue Concerning the Two Chief World Systems. The advantage is that it structures the text very nicely and is likely rather SEO friendly. The book starts by introducing Bill Philips and his MONIAC machine, which simulated the economy, in macroeconomic terms, using water, pipes, tanks and valves. That’s a bizarre idea, why didn’t he use a computer? Philips was working in the period immediately after the Second World War and computers weren’t that common. Also, it turns out that solving certain types of equations is more easily done using an analogue computer – such as MONIAC. Back up a bit, what’s macroeconomics? Macroeconomics is the study of the large scale features of the economy such as the growth in Gross Domestic Product (GDP), unemployment, inflation and so forth. Contrast this to microeconomics which is about how much you pay for your cup of tea (and other things). What’s the point of this, didn’t someone describe economics as the “dismal science”? Yes, they did but this is treating economics a little unfairly. One of Harford’s pleas in the book is to accept the humanity of economists. They aren’t just interested in numbers, they are interested in making numbers work for people. In particular, unemployment is recognised as a great ill which should be minimised and the argument is over how this should be achieved rather than whether it should be achieved. There is a great divide in economics between the Keynesians and the classical economists. The crux of their divide is how they treat a recession. The former believe that the economy needs stimulus in times of recession, in terms of of increased “printing of money”. The latter believe that the economy is a well-oiled machine that is de-railed by external shocks, in happy times there are other external shocks that pass off relatively benignly. The classicist are less keen on stimulus believing that the economy will sort itself out naturally as it responds to the external shocks. These approaches can be captured in toy economies. Tim Harford cites two examples: a babysitting collective in Washington DC and the economy of a prisoner of war camp. The former is a case of a malfunctioning economy fixed by Keynesian means: the collective worked by parents agreeing to babysit in exchange for vouchers which represented a period of babysitting. But the amount of vouchers available was limited so parents were reluctant to spend their babysitting vouchers for a night out because they were scarce. In the first instance this was resolved by printing more baby sitting vouchers: a Keynesian stimulus. The prisoner of war camp suffered a different problem, towards the end of the war the price of goods went up as the supply of Red Cross parcels dried up. Here there was nothing to be done, the de facto unit of currency was the cigarette and there was a limited supply of them and nothing could be done to increase that supply. Yes, Harford highlights that money fulfils three different functions. It’s a medium of exchange, to save us from bartering. It’s a store of value, we can keep money under the bed for the future – something we couldn’t do with our valuable goods if they were valuable. And it is a “unit of account”, a way of summing up your net worth over a range of assets. Is The Undercover Economist Strikes Back worth reading? I’d say a definite “yes”. We’ve all been watching macroeconomics playing out in lively form over the last few years as the recession hit and is now receding. Harford gives a clear, intelligent guide to the issues at hand and some of the background that is left unstated by politicians and in the news. Harford points out that our political habits don’t really match our economic needs. Ideally we would have abstemious, right-wing governments in the boom years and somewhat more spendthrift left-wing ones during recessions. He ends with a call for more experimentation in macroeconomics, harking back to his book Adapt. And also highlights some shortcomings of macroeconomics as studied today: it does not consider behavioural economics, complexity theory or even banks. There’s much more in the book than I’ve summarised here.